^ a b c d d'Huart, J.P.; Butynski, T.M.M. & De Jong, Y. (2011). "Phacochoerus aethiopicus". IUCN Red List of Threatened Species. Version 2011.2. International Union for Conservation of Nature. Retrieved 18 January 2012. Database entry includes a brief justification of why this species is of least concern. ^ Grubb, P. (2005). "Order Artiodactyla". In Wilson, D.E. ; Reeder, D.M. Mammal Species of the World: A Taxonomic and Geographic Reference (3rd ed.). Johns Hopkins University Press. p. 638. ISBN 978-0-8018-8221-0. OCLC 62265494. ^ Randia, E.; D′Huart, J.-P.; Lucchini, V.; Aman, R. (2002). 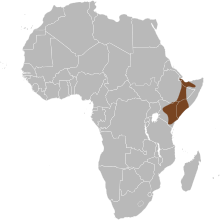 "Evidence of two genetically deeply divergent species of warthog, Phacochoerus africanus and P. aethiopicus (Artiodactyla: Suiformes) in East Africa". Mammalian Biology. 67 (2): 91–96. doi: 10.1078/1616-5047-00013. ^ a b c d e Winkelstern, Ian (2009). "Phacochoerus aethiopicus". Animal Diversity Web. University of Michigan. Retrieved 2013-09-04. ^ Thomson, G. R.; Gainaru, M. D.; Dellen, A. F. van (1980). 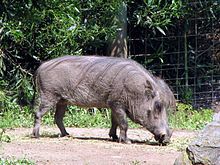 "Experimental infection of warthog (Phacochoerus aethiopicus) with African swine fever virus". Onderstepoort Journal of Veterinary Research. 47 (1): 19–22. ISSN 0030-2465. ^ a b Child, Graham; Roth, Harald H.; Kerr, Michael (1968). "Reproduction and recruitment patterns in warthog (Phacochoerus aethiopicus) populations". Mammalia. 32 (1): 6–29. doi: 10.1515/mamm.1968.32.1.6. ISSN 1864-1547.
d'Huart, J.P. & Grubb, P. (2005). A photographic guide to the differences between the Common Warthog ( Phacochoerus africanus) and the Desert Warthog (P. aethiopicus)[ permanent dead link], Suiform Soundings 5(2): 4-8.